Aaron Gleeman is editor-in-chief at Baseball Prospectus. 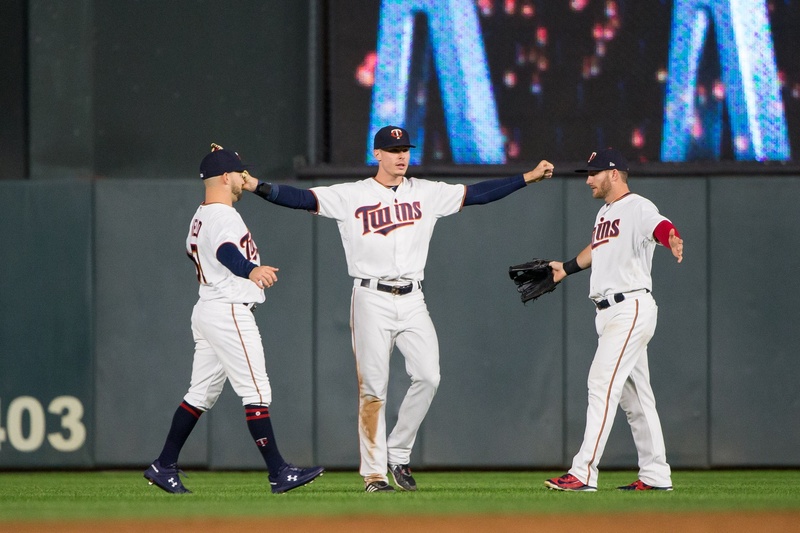 He is one of the longest-tenured Twins bloggers and a longtime friend of Twins Daily. He recently authored an excellent book called The Big 50: Minnesota Twins, a great holiday gift for any baseball fan in your life. He also contributed an excellent feature for our new Handbook on Max Kepler, his unusual progression up to this point, and what we should make of him going forward. Taste a sample below. The plan, heading into the 2016 season, was for 23-year-old Max Kepler to spend at least a couple months at Triple-A, smoothing out any remaining rough edges in his game after being named MVP of the Double-A Southern League the previous year. Instead, he played all of two games for Rochester before being summoned to Minnesota as an injury replacement, and then he returned to the Twins’ outfield for good on June 1. His finally tally at Triple-A? Thirty games, although he hit well (.282/.367/.455) and walked more (16) than he struck out (14), just like he had at Double-A in 2015. Kepler squashed any criticism of him being rushed to the majors by holding his own right away, hitting .252/.324/.447 in his first full month with the Twins. He slumped down the stretch, but still finished his rookie season hitting .235/.309/.424 with 17 homers and 42 walks in 113 games. It was a promising debut, as Kepler displayed three of the key skills—plate discipline, power, and plus defense—that had made him a consensus top-100 prospect. He rated as a below-average hitter, but just slightly, posting a 96 OPS+ where league average is always 100. And his defense in right field was good enough to make him an above-average all-around regular at 23. Predicting the futures of young baseball players is incredibly difficult. I’ve been writing about the sport as my profession for 15 years, with much of that spent ranking and analyzing prospects and specifically Twins prospects. I like to think I’m pretty decent at it, but there’s a garage full of Bobby Kielty rookie cards that might not agree. However, typically when a top-100 prospect has a rookie season like Kepler’s—showing polish and raw skill, earning praise from coaches, and producing average-ish offense with plus defense at 23—the projection fog lifts. Above-average 23-year-old rookies tend to develop into stars. Two years later, Kepler hasn’t moved an inch. How rare is it for a young hitter to hold his own as an average-ish rookie like Kepler did and then basically show zero improvement? In the history of baseball, he’s just the third corner outfielder to have three seasons with an OPS+ between 90 and 99 by age 25. The other two are Dayan Viciedo, a once-promising White Sox slugger who washed out of the majors at 25, and Nomar Mazara, the current Rangers right fielder about whom someone in Texas is probably writing an article just like this one right now. Even finding corner outfielders who had two or more 90-99 OPS+ seasons by 25 is difficult. There are only a dozen of them, total, and only six since 1980. Viciedo was a bust. The jury is still out on Mazara, much like for Kepler. The other three are Phil Plantier, Von Hayes, and—you may want to sit down or at least hold onto something—Delmon Young. Plantier had just one standout full season, posting a 122 OPS+ with 34 homers for the Padres in 1993, and he was finished at 28. Hayes is the success story, by far. He debuted at 22, hit .250/.310/.389 at 23, got traded, and hit .265/.337/.370 at 24. He broke out at 25 with a 124 OPS+ for the Phillies in 1983, and was a star-caliber player for a half-dozen seasons. He hit just .267 for his career, but Hayes drew tons of walks, had 20-homer pop, and played good defense. He’s certainly not a precise comp for Kepler—for one thing, Hayes was a speedster, swiping as many as 48 bases in a season—but you can squint while looking at his career numbers and see Kepler following a similar path. I would not advise squinting at Delmon Young’s numbers, and to save yourself the agita I’d suggest not even looking at all. But if we’re talking corner outfielders who initially hold their own in the majors and then show zero real improvement … well, Delmon is the archetype. Kepler is not Delmon Young, of course, as a player (a million times better on defense, a billion times more plate discipline) or as a person (a trillion times less of a jerk). Want to read the rest of this story, and 70 pages of in-depth analysis of the offseason that’s about to get underway? Claim your copy of the 2019 Offseason Handbook, at a price of your choosing, and you’ll receive it right away. Also, make sure to follow Aaron on Twitter. and—you may want to sit down or at least hold onto something—Delmon Young. I just threw said "something" at my monitor... now I have a broken glass, a broken monitor, and scotch all over my desk. Oh no! Was the scotch hurt? The Twins got the best years of Young's career so Twins fans don't have a lot to complain about there. He wasn't good before the Twins and he wasn't good after, but as a member of the Twins he was OK until that last season when he wasn't alone in throwing in the towel. Delmon is batting cleanup for the Navegantes, the Venezuelan team that features our Luis Arreaz leading off with an 978 OPS, 5 BB and 4SO. Delmon is leading the team with 5 HR, but has 19 SO and 3 BB and a 764 OPS. Astudillo plays for the Caribes, has yet to strike out in 68 AB, and has a 894 OPS. That cant be the first time you've looked at Delmonsie and had that reaction, now can it? I admit this is off topic, but does anyone know how other Twins are doing in winter leagues? It's that last statement that makes me root whole-heartedly for Kepler.BUT, just the mere mention of Delmon Young makes my stomach hurt! !I'm a "hold out hope" guy b/c I'd love to see prospects work out.This, however, does not give me a lot of hope. Meh, 48 SB in the era of Rickey, Raines and Coleman is like 20 now.